The Secret Beach Villa is named after exactly what it promises, i.e. a secret beach location on Koh Samui’s sister island Koh Phangan. 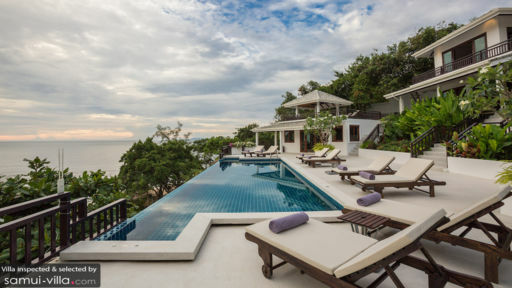 The villa is separated or can be rented as three separate villas; the main villa, the Honeymoon villa, and the Beach villa. 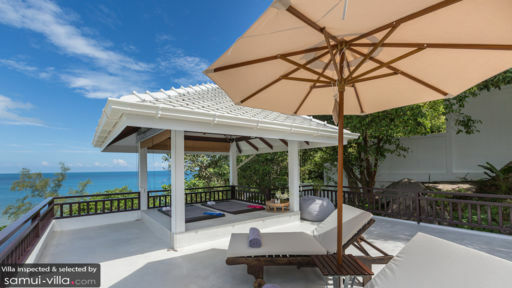 Collectively the villa offers six luxurious bedrooms, overlooking the scenic view of Haad Thong Lang Beach and the neighboring Ko Ma island. There is something for everyone at the Secret Beach Villa with an infinity-edge pool, a kids’ room, BBQ alfresco dining, and much more! The villa offers the main living pavilion, the Honeymoon villa, and the Beach villa with six bedrooms amongst them including 2 kid's room. The main villa offers three bedrooms with one master suite located on the upper floor. It is furnished with a king-sized bed and an en-suite bathroom, leading outdoors it has a private veranda with armchairs. On the ground floor, you will find the family suite with a living area that can be converted into a kids’ room complete with a bed, toys for kids, and ample natural light. The Honeymoon villa is a spectacular space, fully self-sufficient with a kitchenette, king-sized bed, a steam and sauna, and an en-suite bathroom, ideal for couples. The Beach villa is an individual one-bedroom villa again with a king-sized bed and en-suite bathroom. Each bedroom offers excellent views of the neighboring regions. It is not simply a swimming pool and a garden that welcomes you as you step outdoors at Secret Beach Villa. It is, instead a mesmerizing vista of the beach and the Ko Ma island in the vicinity, adjacent to the beach. The horizon is very visible from the infinity swimming pool, where you can even enjoy the gorgeous sunsets each day while relishing the peaceful and tranquil surroundings of the island. What’s more, you can lounge on the sun chairs, or head on over to the other side of the deck where a yoga pavilion under a traditional sala, also furnished with armchairs awaits your arrival. The sala provides another vantage point, wherein you can reap the benefits of Secret Beach Villa’s enviable location. The aesthetics of the villa are essentially contemporary with somewhat traditional Thai accents here and there. The clean, pristine and crisp furniture borders on modern with its neutral tones, and wooden trusses adding an opulent charm the remarkable living space. It opens out to the swimming pool and pool deck through glass doors, a great way to maximize space, especially if you are enjoying a BBQ party prepared by the staff! Up the staircase you will find a semi outdoor living space as well, overlooking the crashing waves and the sandy shores of the beach. 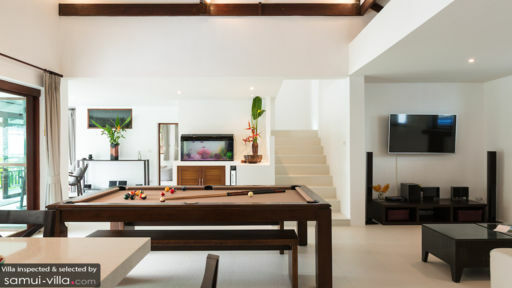 Furnished with a pool table in the center, the living area is a great space for relaxation and spending time with your friends and family. You can lounge on the comfy sofas, or watch some TV, or breathe in the gorgeous panorama while you sip on some cocktails. The western kitchen is a sunny affair, with natural lighting illuminating every nook and cranny of the room. The kitchen with its island has barstools going around, perfect for a spot of breakfast or tea. Outdoors you will also find an alfresco dining area, to enjoy the beautiful backdrop while you dig into the delicious and warm meals prepared by the house chef. A house chef with mad skills will cook up a storm and delight you with Thai culinary treats to tingle your taste buds. The staff can even arrange for BBQ or in-house spa or massage therapies for you to relax and rejuvenate. The Ko Ma island is the neighboring island where you can stop by for a day trip. For the Haad Thong Lang beach, you need only walk down from the villa and there you are! A fishing village is close by with a quaint bakery where you can get breakfast.